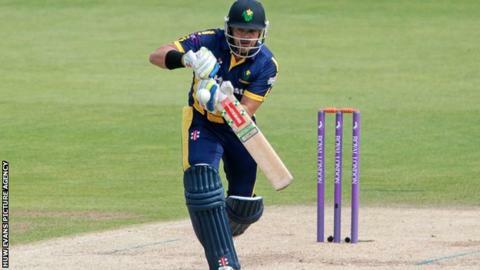 Glamorgan captain Jacques Rudolph says promotion to Division One of the County Championship is a realistic aim despite only one team going up in 2016. The county finished fourth in Division Two last season after being unbeaten in the first half of the campaign. "We've got a really good squad this year," South African Rudolph told BBC Wales Sport. "If we can start well in the first six games and get some momentum, we can really push for the top." Glamorgan have signed Holland fast bowler Timm van der Gugten, while 21-year-old Middlesex seamer Harry Podmore will be available on loan for the opening block of six Championship matches. Last season, Michael Hogan, Graham Wagg and Craig Meschede, who has signed from Somerset after a season on loan, shouldered the vast majority of seam bowling duties in all three competitions. "We've got depth and if you look at Championship-winning teams they've all got depth in the bowling department," Rudolph added. "We are moving in the right direction having signed a few more players, Ruaidhri Smith is bowling well and (all-rounder) David Lloyd's bowling is coming on." New head coach Robert Croft has stepped up after being assistant to Toby Radford for the past two years. Despite insisting Glamorgan will not prioritise any competition, Croft is hopeful promotion in the four-day format is a possibility. "It's one place less going up, but it makes it clear what you need to achieve," he said. "Last season we were on course for half the season but just dropped off. This year we've got more resources in the squad. "In general we played a really strong brand of cricket last year." Glamorgan play a first-class friendly against Cardiff MCCU starting on 11 April, while their opening Championship match is at home to Leicestershire on 17 April.